The second hardest part of blogging is thinking of titles for my posts. I'm certain that any other blogger, or even writer of any kind can relate to that. You have this amazing idea, take some awesome shots, type up a stellar post all in a just a few hours yet the simplest, shortest of tasks consumes your time disproportionately: "What on earth am I going to call this?!" Every now and then though, a product comes along that genuinely needs no preamble, needs little introduction and needs no extra hyperbole. This post is entirely dedicated to one such product. I'm not going to go too cliche and say something like I've always dreamed of owning Christian Dior's Oud Ispahan, because I haven't. In fact, until I travelled down to London for a reunion-slash-iftar with some of my favourite people in the entire world, I can honestly say I didn't really know it even existed. 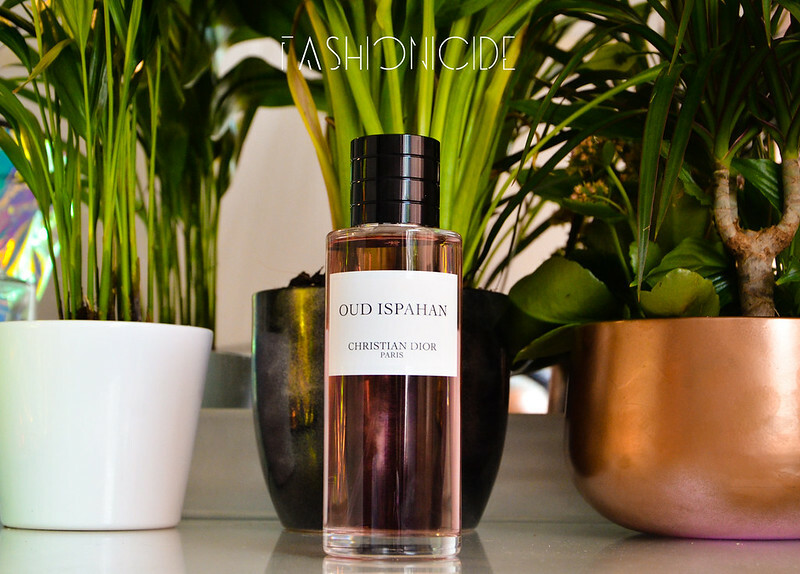 Whilst Oud Ispahan wasn't something I was altogether aware of, Oud most definitely is. I've always adored it in (almost) all it's forms, the sheer overpowering scents are tuly something to behold. I'd begun to notice that some of the more exclusive designer labels were picking up on this and creating their own perfume-based tributes to this most magnificent of Arabian creations, however the ones I'd sampled just lacked that little something, that X Factor. Don't get me wrong, they were all nice enough, but not quite nice enough to convince me to part with hundreds of my own pounds. It was at the afore-mentioned reunion-slash-iftar that my nasal passages picked up on something spectacular. Almost like a scene from a Looney Tunes cartoon, where the delicious looking pie cooling off by the window gives off a visible scent that floats through the air and is caught in the nostrils of your favourite cartoon character. This aroma that was seducing me was being adorned by none other than Sheenie, and she wasn't sat next to me, she was at the opposite end of the table. It was at that point that I knew I needed to have whatever it was she was wearing. And then I baulked when I was told the cost, this most heavenly of perfumes came at a price fitting of something so outrageously perfect. £240 for 250ml. As much as I loved it, my bank account will be with me for life, and I don't think it could ever forgive me for such an extravagant purchase. It just wouldn't understand. I teased myself - nay, tortured myself - by looking in Selfridges upon my return to Manchester, just to smell it once more. Like an addict seeking one last hit, knowing it was no good for them, and they couldn't have it ever again. It was there. It was majestic. My debit card frowned, howled and hissed. No. So I moved on with my life, I went back to my other perfumes. Of course, they would never be the same again after I'd tasted the scent of angels, but they were still there attempting to comfort me. I was getting over it, as much as one can get over coming so close to something so incredible, reaching out and touching it, yet never truly being yours. I was ok.
And then the other half went and spoiled it all by buying it for me. I won't attempt to do this justice by reviewing it as I normally would. I'll say this, and this alone. Go to your nearest Selfridges, find the Dior counter. Look upon the bottle, ask the lady or gentleman for a sample spritz, die, go to heaven, come back again and thank me in the comments section below. Best perfume post ever!!! Love it and I need to smell this asap, I want to experience everything you have described! OK I need to give this a smell -it sounds divine, I like the idea of going to heaven with a scent.